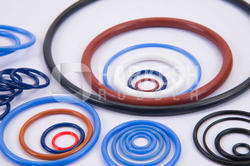 Pioneers in the industry, we offer rubber hnbr o-ring from India. We offer Rubber HNBR O-Ring. Manufactured using premium grade Hydrogenated Nitrile Butadiene Rubber (HNBR), our O-rings offer excellent pressure resistance capacity. Our O-rings are characterized by heat resistance, oil, and chemicals. These are widely used where high pressure is the common norm such as in hydraulic cylinders. Looking for HNBR O-Ring ?